Next Major League Pitcher or Marvel Villain? The right way to write about zombies. In 2008, Wired ran an article about Leland Chee, the guy hired by George Lucas to be the Star Wars “continuity cop” and make sure that, between the series’ films, comics, novelizations, and cartoons, the facts were straight. As any fan knows, the Kessel Run must always be the same distance: invented universes, be they near or far, only truly work if they stick to a firm set of laws and logic. Sadly, older myths don’t have a gatekeeper like Lucas, which makes for many frustrated nerds, subpar entertainment, and, well, vampires that sparkle, werewolves that are actually panthers, and zombies that run a four minute mile. And that’s not usually good. So here is where I put on my Leland Chee hat to make some basic rules for fantasy writers going forward, starting with the most maligned and overexposed of fictional creatures, the Zombie. 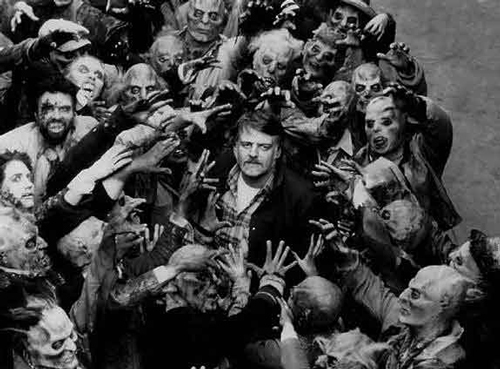 Night Of The Living Dead director/zom-father George Romero with his creations. At this point, zombies don’t have to want to eat brains exclusively, and that’s according to the zombie godfather, George Romero. Personally, I think the brains fetish is not only one of the zombie’s few unique traits, but also just funny, especially if you imagine them in as Phil Hartman-as-Frankenstein-like, shuffling around and trying to bite heads. Since most zombie movies are supposed to be more scary than funny, I can see why this part of the myth has fallen to the wayside. But there is one old rule that can never be broken: zombies can only be killed with a blow to the head. Fire can stop them, but the only thing that can really kill them for good is anything pointy or explodey making solid contact from the neck up. A good zombie story, like any good myth, works best when it’s used to illustrate a greater theme. While Romero began it all with Night of the Living Dead, the sequel, Dawn of the Dead, hits the zombie-as-metaphor on the head by having the human protagonists seek shelter in a shopping mall, and the image of the undead shuffling through a mall is frighteningly close to what a Costco actually looks like on any given Saturday. The zombies of 28 Days Later, a.k.a., The Running Dead. Even if you don’t reveal it at first, make sure your outbreak has a clear origin, and that that origin isn’t arbitrary. Not all zombie stories do this— many of the original good ones didn’t— but now that pop culture is hitting zombie saturation, just having the world break out in a sudden corpse craving doesn’t cut it anymore. While questionable in other ways, 28 Days Later pinned the origin of the zombie outbreak in a rage virus, which was a nice touch; instead of zombies as complacent and mindless, they were furious and driven. In Shaun of the Dead, no zombie was fast enough to come between our hero and his Cornetto. 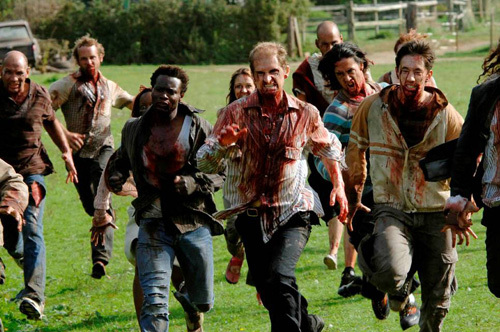 Of course, since 28 Days Later sprinted onto the scene in 2002, there has been some debate as to acceptable zombie speed. Purists like Simon Pegg, who co-wrote/starred in the excellent “zom-rom-com” Shaun of the Dead, strongly believes that “zombies don’t run,” and while I buy the 28 Days Later excuse, I tend to agree with him that, in an overall sense, having speedy zombies is like having vampires who prefer elbows over necks. As Pegg puts it, “Death is a disability, not a superpower.” The rule of thumb then is that zombies are slow unless you have an incredible excuse for them to pick up the pace. They also do not have complex thoughts or speech. Sorry, Warm Bodies, but vampires have the monopoly on keeping their personalities and thought processes intact as the undead. One of the (many) nerd complaints about The Walking Dead is that their zombie movement choices are erratic; some are fast, some are slow, some are just wriggling torsos who want their bikes back. The show’s creators have said that the zombies’ speeds depend on the individual zombie’s injuries, but that theory doesn’t really check out, and the show’s tendency to break many of its own rules, let alone to break many of the comic’s rules and storylines, is getting more annoying than The Governor's continued existence. So no matter what you choose, be consistent. Just remember that includes trying to be consistent with zombie history overall.